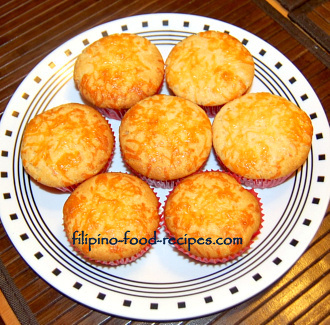 Craving for a cheese cupcake Filipino style? Yes, that dense cupcake sweetened with condensed milk and topped with strings of toasted cheddar cheese. This Pinoy cheesecake is like no other. It is compact and solid, with a contrasting sweet cake and salty cheese taste. The best part is the 'muffin top' -- sticky, sweet top with strings of chewy, salty cheese... yummy! The challenge here is how to keep the cupcake moist - since most of those available in bakeshops tend to be dry and hard -- as we say nakaka-hirin. The original recipe that I had was from back when I took a baking class at The Maya Kitchen in the '90s. I have tweaked it a bit to suit my taste. I like using part-butter, part-oil to keep my cake moist, even after refrigeration -- which is not really conventional in baking. But I am more concerned of the end result rather than the convention, so as always, choose whatever works for you. 1 Mix together the dry ingredients and sift. In a separate container, mix together the condensed milk and vegetable oil. 2 Cream butter with sugar until light in color. Add the eggs one at a time. 3 Add alternately the dry and wet ingredients, starting and ending with the dry, BUT DO NOT OVER-BEAT. 4 Stir in the cheddar cheese. 5 Using an ice cream scoop, portion the mix on lined cupcake pans and bake for 25 mins or after testing for doneness (see below). To test for cake doneness, use a toothpick or a bamboo skewer and insert it into the center of the cake. If it comes out clean, the cake is done. Another way is to lightly tap the top center of the cake. If top is firm, solid and springs back to form, the cake is done. Over-beating the mix after you put the flour in could result in tough cake. Try to just incorporate the wet and dry ingredients and do not over-mix. Buy baking powder that says 'Double Acting' on the can. This ensures your cupcake rises properly during baking. Salt heightens and brings out the flavor in any dessert or cake so make sure you don't forget adding it in. Freeze your cheese for a little bit so you could easily grate or shred it. You might want to do a half-batch first to try the recipe. A full batch makes about 2 to 2 1/2 dozen cupcakes.